Living in Las Alpujarras we’re reminded of its Moorish past on a daily basis in the architecture, fruit trees and acequias. We’ve read a few modern books about Spain’s past but the History of the Moors of Spain was written in the 18th century – around the time of the French revolution and the United States gaining its Independence. In the 10th and 11th centuries, when the kings and queens of northern Europe were living in relative hovels, Córdoba was considered the most culturally advanced city in the world, with extensive libraries of books from all cultures and religions, where men and women were educated equally. Descriptions of the exquisite buildings – and gardens with pools filled with liquid mercury – are images from the book that endure. The author uses accounts of those who were there at the time and recounts their reactions to the sophistication and beauty of such an advanced culture. 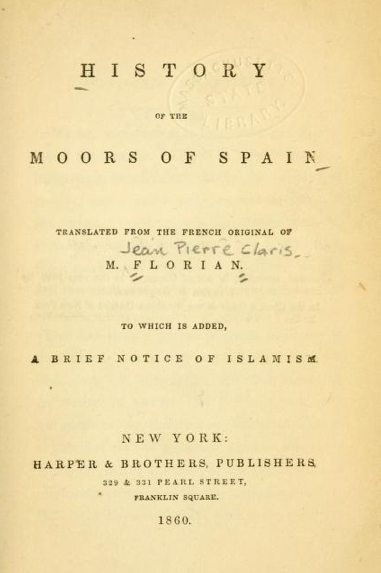 Written by Jean-Pierre Claris de Florian – a Frenchman with a Spanish mother who lived between 1755 and 1794 – the book is, considering its age, surprisingly easy to read. Florian is famous mostly for his children’s fables, which may explain why. The book leads you through the reigns of each Moorish leader and their political strategies, strengths and weaknesses. It gets under the skin of the culture and habits of the Moors which left us with a sense of what it might have been like to be in Spain between the 8th and 15th centuries rather than reading a long list of dates and battles, though it does have those too. The book is available as a free download for Kindle or can be read online – here’s an 1860 edition with an interesting ‘publishers advertisement’ as a preface. « No basil? Can we take the kitten instead? ¡qué interesante! and it’s available online too. ¡excelente! If you can, let us know what you think about the book. In the above summary you mention “gardens with pools filled with liquid mercury”. I read the book but found no mention of “gardens with pools filled with liquid mercury” anywhere in the book. Can you kindly indicate the page/pages where this statement occurs or elaborated. Thank you. Thanks for getting in touch. We must apologise – that sentence (which uses ‘quicksilver’ in place of mercury) is from a book we read at the same time – ‘The Moors in Spain’ by Stanley Lane-Poole. It is available on Kindle for free download, and possibly elsewhere. Many thanks for your helpful answer to my question.